Your generous financial and prayer support allows By Provision to give others potable water and the opportunity to know and follow Jesus Christ. May the abundant life of peace and joy fill your heart as you read about the results of your giving to By Provision so that all may know Jesus Christ. 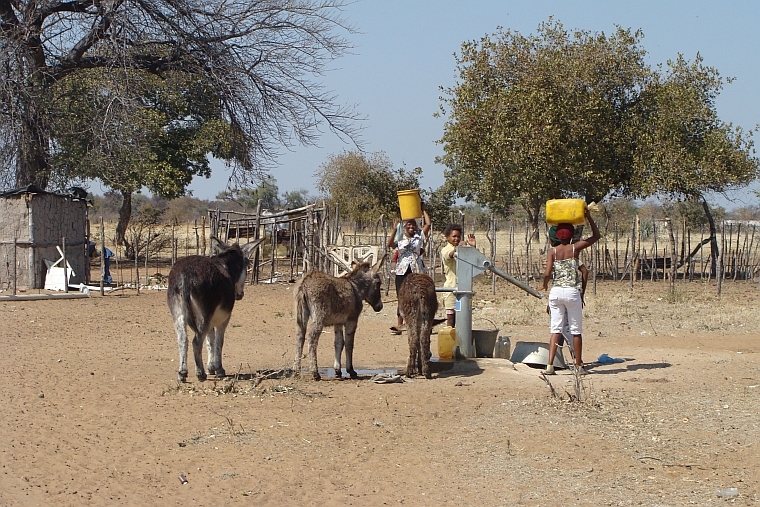 20 boreholes rehabilitated in Namibia. No successful drilling in Botswana in 2011. Discipling African Teens graduated 7 teenage girls. DAT, home for 10 teenage high school young ladies. They enjoyed community service, pottery, swimming, music lessons, Bible lessons, evangelism training, and celebrating birthdays. Humanitarian aid (clothing and food) distributions (3) in Tsumeb. Other countries served: Lebanon disaster relief, Kenya, and USA. 7 Volunteers came to Angola working from 1-4 months each doing evangelism, training, drilling, and discipleship. 1 International disaster relief project to Bah, Iran: a water project and school supplies distribution to Muslim community and discipleship of believers. Comores is a group of islands north of Madagascar. It is one of the few remaining one hundered percent Muslim countries in the world. We were invited by The Bahari Foundation, an educational non-profit organization, to teach in the Comores at the university. In Comores anyone who graduates from a university is highly respected and considered a leading citizen in the community. Therefore reaching these university students for Christ has the potential to transform the whole society. The university also holds continuing education for adults at night. Teaching provides a fast and natural way to establish relationships with students and their families. Mrs. Wilkins taught four classes to first and second year students. Mr. Wilkins taught adults at night in the continuing education program and at Civil Aviation and Unicef. The Wilkins made the Jesus film in French and English available to the students in the privacy of their home. The Wilkins were able to establish weekly Bible studies with some of these students also. Community living is a vital part of life in the Comores. The Wilkins established growing relationships with our neighbors and spent a lot of time sharing cultural and religious information with each other. The Wilkins also welcomed neighbors into their home for meals, birthday parties for children, and use of their refrigerator and television. This strengthened relationships with the community and gave them tangible evidence that they cared about others. Driving a vehicle proved to be a great ministry tool also. Most people travel by shared taxis and many are forced to walk for miles when they don’t have the taxi fare. People will call out to vehicles as they pass and ask for a ride. This provides a captive audience for ministry. Some times the rides are short and other times long, either way the rider would welcome the chance to get in and talk. This was especially effective when there was bad weather, an occasional holiday, or taking a day off from work. The Wilkins would simply get in the car and start driving along the main highway. The most exciting part of this time was being in a Muslim country during the war with Iraq, especially since the only mass media in the Comores is the local radio station and one Arabian station that broadcast. The Comorians therefore only received Muslim biased information and reports. The Wilkins were threatened several times and physically attacked once. It was absolutely amazing to see how God protected the Wilkins and even used these events to deepen relationships with the Comorians showing their love and God’s love for them. Mr. Wilkins led one young man to Christ that is of particular note. This young man is a political leader and is being groomed to be a future president. The day we left he stated that when he becomes president his main goal will be to bring freedom of religion to Comores. May 6th through September 10th of 2002 Mr. and Mrs. Wilkins performed literacy, construction, humanitarian aid, and evangelism in Angola. This project is in partnership with the International Mission Board, Crosslink, and Alfalit International. Mr. Wilkins focused on building eight church structures. Mrs. Wilkins focused on Portuguese literacy training 750 teachers and women’s and family ministry. At night the Wilkins showed the Jesus film to approximately 18,000 people. Both participated in the distribution of donated medicines to the Baptist Convention of Angola and $60,000 of clothing and food to ten villages in the north of Angola. This work was covered on regional and national radio and television. We had volunteers to come and help serve the Angolan people. Roberto Perez, president Alfalit, International came May. Another Alfalit member from Miami, Aida Iglesias, helped in August. Jason and Ashley, two students from Baylor University came to help with construction in July. Jamie Hall, a student from Samford, along with Jim Hall, a businessman from Michigan, also came to help in mid August. Jamie worked at the medical clinics distributing medicine and providing medical consultations. Jim helped finalize construction at one site and start the largest church building we did also. God moved in a mighty way!